This House bill would require that zero-emission vehicles be included in the larger rental car fleets. Hawaii has pledged to meet two very ambitious objectives: the 2015 Paris Agreement goal to do its part to limit the amount of global warming to less than 1.5 degrees Celsius, and the 100 percent renewable energy portfolio standard by the year 2045. The 2018 Hawaii Legislature has a number of measures seeking to mitigate the impact of global warming and climate change. One measure that has the potential to effectuate significant change, however, has yet to receive a hearing — but should. House Bill 2273 would require rental car companies to include zero-emission vehicles in their fleets. 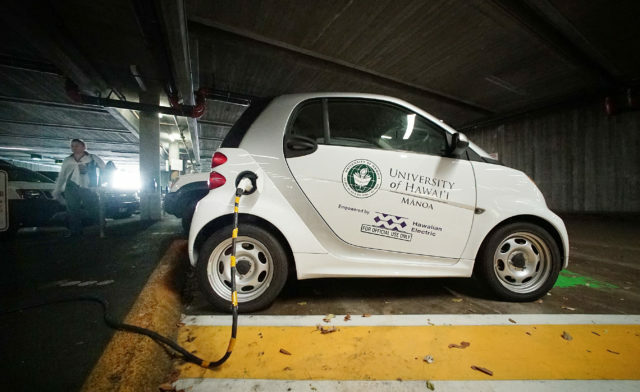 A University of Hawaii electric Smart car at the state Capitol’s charging station is the kind of vehicle proponents of clean energy want to encourage. The bill has an added benefit: demonstrating to all who visit the 50th state that it is “a leader in clean energy and sustainable transportation,” as the bill states. And it seems likely the addition of electric vehicles for tourists would mean more EV charging stations for all of us. Given that Hawaii saw a record-breaking 9.4 million visitors last year, having many of them rent an electric, hydrogen fuel cell or plug-in hybrid vehicle to tool around the aina would be a welcome evolution. The bill establishes a standard of vehicles with 16 or more kilowatt hours of battery storage in order to qualify as a full zero-emission vehicle. HB 2273 also calls for the state Department of Transportation to levy a surcharge on rental cars with internal combustion engines. The money would go to a special fund and program to help promote zero-emission vehicles and infrastructure such as recharging stations. The bill, should it become law, would not punish small rental operators but instead only affect those with more than 200 light-duty passenger vehicles. The nonprofit Blue Planet Foundation, a local leader in the drive toward clean energy, likes HB 2273. “Without such a policy, the transition to clean transportation will be slower, and visitors will receive conflicting messaging about Hawaii’s ‘clean destination’ image,” according to the foundation’s 2018 legislative agenda. Another bonus: rental car companies can sell the vehicles to the local market, usually about a year and a half after the vehicle’s use. Sure, there is bound to be resistance from the rental car businesses that will complain of cutting into profits. But those profits come at the expense of burning fossil fuels. Unfortunately, HB 2273 faces a difficult path to passage. It has three separate committee referrals, a high bar before the Feb. 8 deadline to advance at the Legislature. Unless it passes its first hearing — a joint meeting of two House committees — before then, it’s probably dead for the year. That would be a shame. Even if the bill only serves to start a conversation about conversion to EVs, it would represent progress. That is the direction other parts of the world are moving in. The Jan. 29 issue of Time magazine notes that 54 percent of global car sales are expected to be electric by 2040. Meanwhile, there were an estimated 700,000 EVs sold in China last year. The conversion is slowly happening here. We are seeing more Nissan Leafs, Chevy Bolts and Teslas on our streets and highways. And just this week Mayor Kirk Caldwell launched a pilot project on 23 bus routes for an electric bus on loan from Proterra Inc.
“This testing will confirm the viability of these vehicles as the City and County of Honolulu transforms its ground fleet to completely renewable energy sources by 2035,” according to the mayor’s office. We have a long way to go to driving clean. Data for 2015 show more than 1.2 million registered vehicles statewide, or nearly one vehicle for every person. Of those, just over 4,000 were EVs. Legislators, let’s give HB 2273 a listen.